Showers and thunderstorms. High 67F. Winds SSW at 5 to 10 mph. Chance of rain 90%.. Rain. Low 43F. Winds WSW at 5 to 10 mph. Chance of rain 80%. Rainfall near a half an inch. 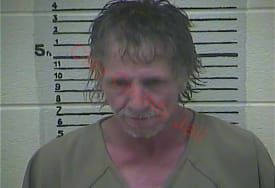 Clay County Sheriff Patrick Robinson is reporting that on April 14, 2019 Clay County Sheriff Deputies Jeremy Gabbard, Cody Blackwell and CSO Kendric Smith arrested Jimmy Maxie, 48, of Collins Gibson Road. The arrest occurred at Colsons Gas Station when Deputies located the subject inside the store. The subjects information was ran and was confirmed through Clay County Dispatch that the subject had an active Warrant of Arrest through Clay County Circuit Court. The photo attached is courtesy of the Clay County Detention Center.